Sullivan was born in Boston in 1856 and, at age 16, attended the fledgling Architecture School at M.I.T. At age 18, after working under architects Frank Furness in Philadelphia and William LeBaron Jenney in Chicago, he studied at the Ecole des Beaux-Arts in Paris for about six months, followed by a trip to Italy, where he was particularly impressed by the Sistine Chapel. Sullivan then returned to the United States and settled in Chicago. After working for a few years at Dankmar Adler’s firm as chief draftsman and designer, they formed the firm of Adler and Sullivan in May 1883. Sullivan was the primary design partner and Adler was the engineer. 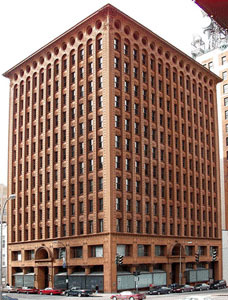 Adler and Sullivan’s buildings, including the Auditorium and Stock Exchange Buildings in Chicago, the Wainwright Building in St. Louis, and the Guaranty Building, were at the leading edge of American architecture and skyscraper design. The Guaranty Building was Sullivan and Adler’s last collaboration; Adler withdrew from the firm as the building was under construction. Prevailing tastes preferred a more traditional neoclassicism over Sullivan’s innovations, and Sullivan increasingly turned his practice from skyscrapers to smaller buildings in small towns. His career declined, and Sullivan died in obscurity and poverty in Chicago in 1924. The Guaranty Building, which opened in 1896, is recognized as one of Sullivan’s and is an outstanding example of his innovations. In the 1890s, the steel skeleton skyscraper was a new and uniquely American building type. Most early skyscrapers borrowed heavily from more traditional European design and used strong horizontal lines to de-emphasize their verticality. Sullivan wanted a bold architectural style for the new building type that would express the confidence and prosperity of the United States at the end of the 19th century. He rejected traditional designs and celebrated the skyscraper’s verticality. 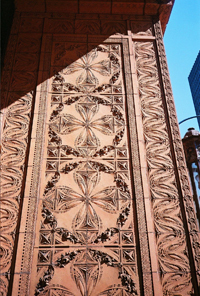 While similar to his 1890 Wainwright Building, which combines masonry with terra cotta for ornament, the Guaranty Building makes ornament the focus through the use of terra cotta to cover two full exterior surfaces. The piers between the windows form strong vertical lines that draw the eye upward to the dominant cornice. Despite the technological advancements that made the skyscraper possible, including high-quality structural steel and electric elevators, Sullivan strove to connect the building with the natural world. His ornamentation for the Guaranty was inspired by flowers, seedpods, and, at the top of the building, the spreading branches of a tree. The Guaranty represents the pinnacle of Sullivan’s forward-thinking design and marks the beginning of the uniquely American style of architecture that influenced the young Frank Lloyd Wright, who worked for Adler and Sullivan from 1888 to 1893. Even after leaving the firm, Wright continued to revere Sullivan, calling him “the Master.” As Sullivan lay on his death bed, he gave Wright an extensive collection of his drawings. The drawings, along with other Wright memorabilia, now reside at the Avery Library at Columbia University. Taylor died the same month the building plans were completed. The Guaranty Construction Company of Chicago acquired the plans and built the building between February 1895 and March 1896. At 152 feet, it was the tallest in the city. The structure originally had a “U” shape, with an open court to the south to provide natural light. The light court, in the center of the U, was faced in white glazed tiles to reflect as much light as possible. The Guaranty was renamed the Prudential Building in 1898 to acknowledge refinancing provided by the Prudential Insurance Company. Both names can be seen above the entrances. For decades, the structure was one of Buffalo’s finest business addresses. The Great Depression brought hard times for the building. Although recognized as an architectural masterpiece as early as 1940, especially in Europe, the building deteriorated through the next several decades. In 1955, an unfortunate “modernization” project added a fiberglass exterior to the lower floors and a dropped ceiling in the lobby. 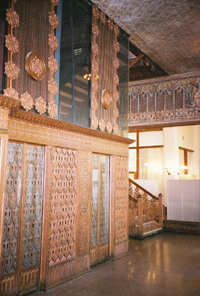 Later cleaning efforts damaged the intricate terra cotta with harsh sandblasting. The decline accelerated with a fire in 1974 that damaged the interior. Occupancy dropped, and the building was sold at auction. Despite a growing appreciation for the building and its designation in 1975 as a National Historic Landmark, by 1977 an out-of-town owner was considering plans to demolish it to make the site more marketable. Strenuous objections from preservationists in Buffalo and around the country convinced the owners to be patient. Civic leaders, most notably Senator Daniel Patrick Moynihan, secured a series of grants and loans to restore the building. By December 1983, the $12.4 million restoration project was complete, and the officially re-named Guaranty Building again took its rightful place among Buffalo’s premier office buildings. The building’s future was threatened again in 1998 when its owner went into bankruptcy. Hodgson Russ LLP, which had been a leading force in earlier efforts to preserve the building, purchased it to use as its principal Buffalo office, thus ensuring the Guaranty Building will continue as one of America’s most important architectural landmarks. In 2006, Hodgson Russ began an extensive two-year renovation project that included a complete renovation of the interior; painstaking repair and restoration of art glass and other external features; and a restoration of the lobby that simulates the original light court. 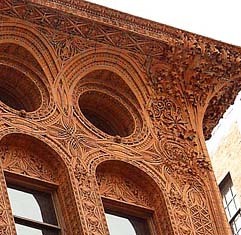 In 2008, the firm began renovations to the building’s distinctive terra cotta facade. The firm’s renovations complement rather than compete with Sullivan’s design, resulting in a building that looks forward to a bright business future in Buffalo while respecting the proud history of both the building and the city it calls home. Terra cotta (Italian for “baked earth”) is a building material that uses clay to form durable, versatile, and fireproof tiles. It can be formed into a variety of shapes, including very intricate designs. Once fired at high temperatures, much like a clay flowerpot or ceramic dinner plate, terra cotta gives the look and feel of stone, but is comparatively lightweight and inexpensive. 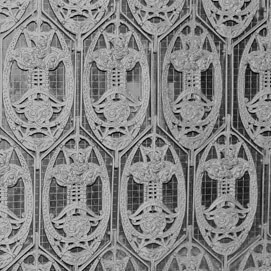 Terra cotta was a favorite material of Louis Sullivan and other late 19th-century architects, both for ornament and as a fire retardant. Many notable buildings in Buffalo use terra cotta extensively, including the Niagara Mohawk, Telephone, Calumet, Sidway, and Ansonia Buildings, and Shea’s Performing Arts Center and the Catholic Center. Photographs by Victor Shanchuk, Jr.